Developing a mature integrated GRC capability that drives Principled Performance requires the participation of many players. 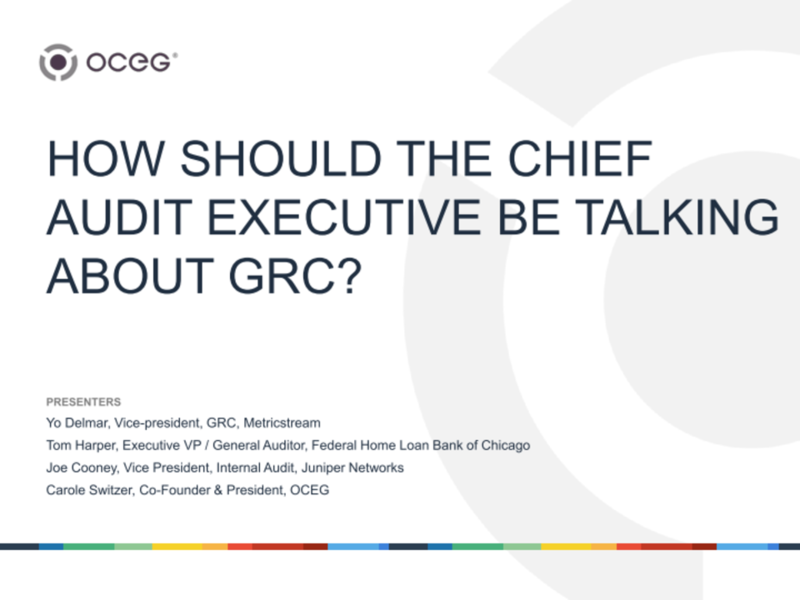 In this webinar, we discuss the role of the Chief Audit Executive in guiding critical conversations with other key executives to ensure a strong GRC strategy. Business success requires that information about performance, risk and compliance be clear, consistent and capable of evaluation. The CAE has a key role to play by guiding a series of critical conversations that will help to develop and drive integrated GRC capabilities that support business objectives and provide actionable information. Whether you are the CAE or a member of the audit team, or are in another GRC role in risk or compliance, this webinar will help you understand the conversations that should be taking place and to participate in them in your own organization. Identifying key points for CAE conversations with the Board and executives that will break down organizational barriers to effective risk management, compliance efforts and implementation of the overall GRC strategy. We have emailed instructions to access How Should the Chief Audit Executive be Talking About GRC Slide Deck to . Make sure the email arrives in your inbox: either add "support@oceg.org" as a safe sender to your email platform, or if you use Gmail, drag our email into your Primary tab.